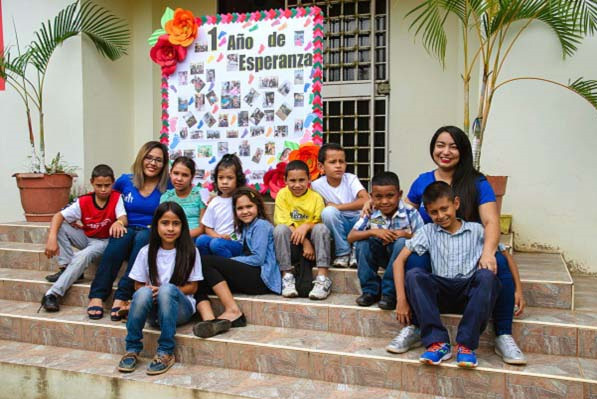 The NPH Honduras transition home, Casa Mi Esperanza, celebrates its one-year anniversary. Waiting is oftentimes one of the most difficult things for us to do. It can be frustrating and, when coupled with uncertainty, worrisome. For a child who has recently been removed from a situation of risk and requires urgent attention, waiting to find out where he or she will call home for the next few days, months, or even several years may seem unbearable. At NPH Honduras, our Casa Mi Esperanza, or “House of Hope,” works to provide these children with a loving, safe, secure environment, while social workers conduct investigations to place children back with their family, or when family falls out of the child’s best interest, in the best long-term solution possible. Casa Mi Esperanza, which celebrated its one-year anniversary in August of 2018, is a primary example of how we put our values to practice and try to benefit the surrounding communities. What started as a series of meetings between NPH, the Directorate for Children, Youth, and Family (DINAF, Honduras’ child welfare agency), the United States Agency for International Development (USAID), and the United Nations High Commission for Refugees (UNHCR), has grown into a home that provides quality services and care to a larger population of vulnerable children around the country. And these services are a step in a new, impactful direction for NPH. Unlike our “Rancho Santa Fe” main home outside of Tegucigalpa, which provides a secure, loving, long-term family for children whose biological families simply cannot provide a healthy or safe environment to grow and develop, our Casa Mi Esperanza focuses on short-term care, providing a loving place for children to transition out of danger, while professionals work to move the child into a long-term, stable, healthy home. It is this priority on “family tracing and reunification” that makes Casa Mi Esperanza special. Mobilized by a team of caregivers, drivers, social workers, psychologists, and medical professionals, the home provides transitional shelter and care for up to 20 children at a time. Since it first opened its doors on July 18, 2017, about 75 children have received individualized care and about 60% of them have been reunified with their families through a reintegration program modeled after the one run at our main home outside of Tegucigalpa. Our goal isn’t to keep children from their families or even to make NPH their first choice – our social workers always aim to reunite children with family members whenever possible and safe. When that cannot be done in the best interest of the child, our goal is to find the best remaining solution for them and their individual futures, which in some cases might not be NPH. For many other organizations working with children, the logistical or financial difficulties to make this kind of program work are too high. But because of your support, the work that we do inside and outside of our homes provides something that these children would not receive otherwise. 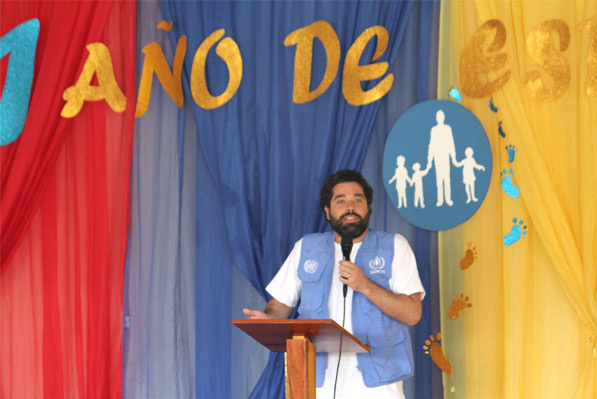 Cristian Aguilar, the former director of the home, describes the beginning of the home as slow and challenging, but feels that during its first year, the home made significant progress in terms of placing children in better environments. Most of the kids are reintegrated with their families, some find alternative homes, and a few come to NPH. “They come crying because of where they came from, and they leave crying because they don’t want to leave,” he says with a smile, proudly explaining how within the home, creating as much of a family-like environment as possible is prioritized. What happens in between these tears is the magic. In the future, Aguilar sees the home becoming more involved with the community and providing care to a greater population of children, something that is likely to happen with NPH Honduras’ growing cooperation with the Honduran government and other NGOs specializing in childcare. Photo above: The growing Casa Mi Esperanza family sits together on the steps of their home. Photos below: a representative of the United Nations (UN) talks about the agency’s collaboration with NPH. 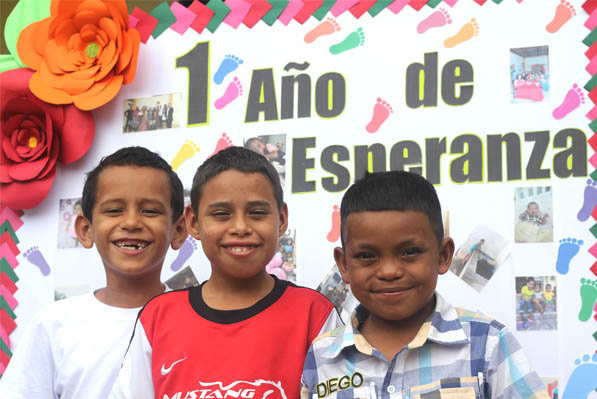 ; Boys pose in front of sign at one-year anniversary event for Casa Mi Esperanza.